Once risks are identified, they should be thoughtfully categorized to serve these objectives while retaining focus, meeting transaction timeline objectives, and leveraging the efforts of those involved. 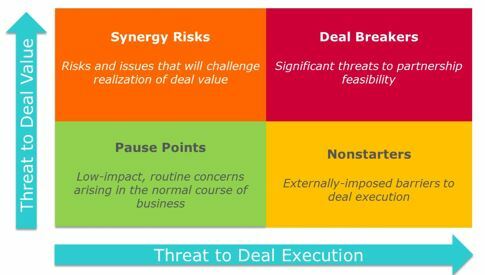 To make sense of what can be an extensive laundry list of risks and issues, it can be helpful to assess each one for its potential to threaten “Deal Execution” and “Deal Value,” as shown in the Deal Risk Matrix [Figure 1]. The matrix categories are discussed below. While it is uncommon to get as far as the due diligence phase before uncovering Nonstarters, it occasionally happens. As the name suggests, these carry the highest deal execution impact, outside of deal value consideration. These risks are typically a result of independent, externally-imposed barriers to the transaction. Examples include major restrictive covenants established by other partnerships/arrangements to which the subject organization is a party, or significant antitrust concerns arising from a deeper exploration of the subject and its current and prior ventures and activities. Deal breakers must be exhaustively investigated to provide the buyer with sufficient information to decide whether to move forward with the transaction. Synergy risks should be appraised from both a strategic and financial perspective to determine what post-transaction integration efforts may be required to manage/mitigate those risks; developing a plan to do so is fundamental to addressing synergy risks. Due diligence findings of this nature should cause the buyer to pause and take note, but pose little (if any) threat to moving forward with the transaction, are unlikely to trigger high-priority post-transaction integration and planning activities, and may ultimately present an opportunity. The ultimate success of any deal relies upon the ability of both parties to mitigate risks and resolve issues together. Doing so means taking a strategic approach to due diligence by developing an approach that furthers the ultimate objectives of the process and serves the ultimate goal of building a future together.